August 7, 2012 - U.S. Transportation Secretary Ray LaHood announced a $17.6 million grant to rehabilitate a runway and taxiway at Cincinnati Northern Kentucky International Airport. "Investing in our nation’s airports promotes economic growth," said U.S. Transportation Secretary Ray LaHood. “This funding will help the airport make critical repairs to aging infrastructure and keep aircraft moving safely and efficiently through Cincinnati." Both Runway 18L-36R and its parallel taxiway Sierra are used extensively by several airlines that rely on Cincinnati as a hub. The Cincinnati Northern Kentucky Airport ranked 11th nationwide in 2011 for cargo. A total of 2.8 billion pounds of cargo landed at Cincinnati, a 16 percent increase over 2010. “Upgrading airport infrastructure at Cincinnati Northern Kentucky International will help maintain a safe and efficient air transportation system for cargo operations as well as passengers,” Acting FAA Administrator Michael Huerta said. This grant will support rehabilitation of the entire 10,000 foot- long runway, and 1,800 feet of the south end of Taxiway Sierra, which is parallel to 18L/36R. The runway and taxiway are more than 20 years old, and the pavement has reached the end of its useful life. The project is part of the airport's pavement management program, which is updated annually. The project will be done in two phases beginning Sept. 1, 2012 and ending Dec. 15, 2013. Total project cost is $23.5 million with $17.6 million from the FAA's airport improvement grant program. The Kenton County Airport Board will fund $5.9 million of the project. Cincinnati Northern Kentucky International Airport has two other parallel runways and a crosswind runway that will remain open during construction. Cincinnati Northern Kentucky International Airport, sometimes called the Greater Cincinnati Airport it serves the Greater Cincinnati metropolitan area. Despite being located in Boone County, the airport operations are governed by the neighboring Kenton County Airport Board. The airport's code, CVG, comes from the nearest major city at the time of its opening, Covington, Kentucky. 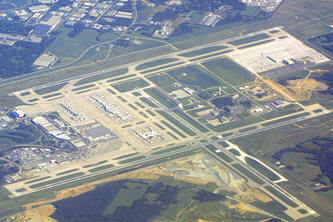 Cincinnati/Northern Kentucky International Airport covers an area of 8,000 acres.